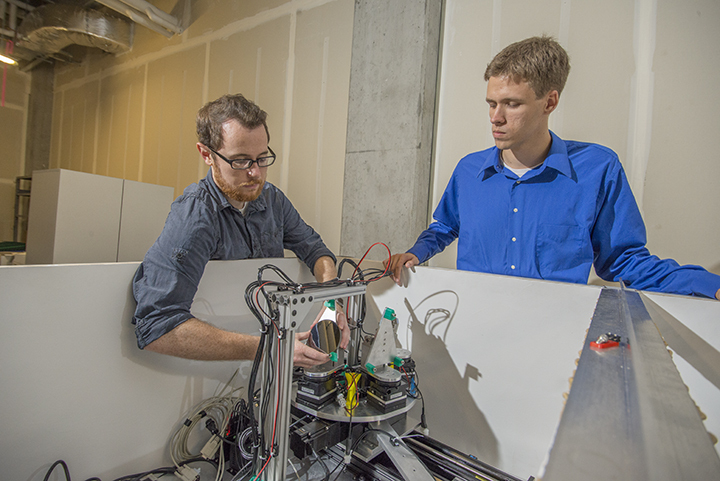 CEI Graduate Fellows Devon Mortensen (l) and Alex Ditter (r) use custom x-ray instruments created at UW to study interactions in working battery materials. Batteries have been around for more than a century. Yet, there is still much work to be done to understand battery materials and the chemical interactions that occur inside an operating battery. A new tool developed by UW Clean Energy Institute (CEI) faculty and students will provide important insights that could help scientists and engineers design more efficient and cost effective ways to store energy on the grid, as well as power personal electronics and electric vehicles. In order to create higher performing and longer lasting batteries, faculty and students at UW CEI are at work to improve the atomic-level understanding of working batteries. One of the key instruments used to peer into the atomic details of an operating battery is a synchrotron, which is a type of particle accelerator that creates exquisitely intense x-ray beam. There are a handful of these very powerful $1 billion user facilities in the world, and high demand for their x-ray beams generally results in a delay of several months between requesting the use of an x-ray beamline and any actual experiment. “Despite the world-class nature of the instrument, this log jam of scientists waiting to test their materials at the world’s most popular and most powerful scientific user facilities is actually limiting the advancement of battery materials research,” according to Jerry Seidler, UW professor of physics. 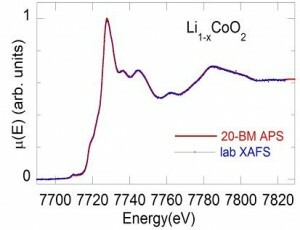 The nearly identical graph lines compare data collected using the Seidler group’s lab XANES instrument with that taken on the same sample at the Advanced Photon Source, a synchrotron x-ray user facility operated by the US Department of Energy at Argonne National Labs, outside Chicago. The positions and relative sizes of the different features are directly dependent on the local electronic environment for the cobalt atoms in the battery electrode sample being studied. To address this challenge, Seidler and his team of graduate students have developed a new way to move some types of advanced x-ray spectroscopies away from the synchrotron light sources and into the conventional lab setting. Their primary focus has been on the technique of x-ray absorption near edge structure, known as XANES. XANES is a penetrating method that can interrogate how both the packing and charge of ions evolve as a battery is used, abused, and fails. Remarkably, Seidler and his group have replicated synchrotron-based battery results using an instrument they created and built over the past 18 months for only $25,000. Based on this success, the Seidler and the CEI are working together to build, commission, and operate a more powerful lab-based XANES system. The CEI-XANES user facility, that will provide UW research groups a unique scientific tool, and strategic advantage in their research. “Our goal has been to develop a XANES user facility that can be relatively inexpensively assembled from existing, commercial, low-maintenance components. As a user facility, it has to be so straightforward to calibrate and operate that on any one day a UW graduate student can formulate a new battery electrode material, put the material into a test battery cell, and then have XANES results before they go home. We want to enable same-day, every-day progress for innovative ideas in advanced battery materials.” Seidler says. CEI Director Dan Schwartz says that the commissioning of the CEI-XANES user facility on campus in 2015 will have a profoundly positive impact on UW energy research. “Now, our faculty, graduate students and local industry can get almost immediate access to the instrument they need to analyze their materials. They can devise experiments, get results they need to understand their battery performance, and then quickly make improvements, all in the course of a week. The impact this will have on our ability to carry-out world class battery science, and develop better batteries, can’t be overstated,” Schwartz said. Seidler believes every-day access to a XANES instrument for UW departments and local industry will prove to have many additional benefits. Seidler and team recently published a paper about their instrument and results in the Review of Scientific Instruments. Funding to development the lab-based XANES technology was provided by the UW Clean Energy Institute, the U.S Department of Energy and the National Nuclear Security Administration.